We have over 20 roundabouts and shrub/flower beds in Stafford available for businesses and other organisations to advertise on. Many of our roundabouts and beds are located in areas that experience high levels of traffic at peak times throughout the week and signs are exposed to public viewing 24/7 for 365 days a year. We offer a three tier pricing structure (roundabouts only) that offers discounts in exchange for longer term advertising agreements. Each new arrangement will require a formal agreement to be signed. This details the nature of the agreement, including price. The annual price includes the installation of your initial signs (additional charge applies to each sign that is subsequently changed). We write to current advertisers each year to remind them of the status of their arrangement. Those coming to the end of their agreement will have the opportunity to renew. Please note: Signs are 600mm x 440mm and must feature the Stafford Borough Council logo in the top right-hand corner (blank template supplied as pdf) and restrictions apply. To enquire about advertisements or be added to our waiting list please email streetscene@staffordbc.gov.uk or call 01785 619401. We offer large, high quality hanging baskets to businesses and organisations in and close to Stafford and Stone town centres. 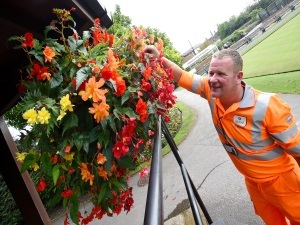 By taking a hanging basket, organisations are ensuring that Stafford and Stone continue to provide wonderful displays that residents, workers and visitors can enjoy throughout the summer months. The baskets are delivered at the end of May or early June (weather permitting) and, depending on the season, remain for approximately 16 weeks. The price includes watering and dead heading and if brackets are required, we provide and fit them*. Baskets have a reservoir in the base that can hold sufficient water for three days. To enquire about summer hanging baskets please email streetscene@staffordbc.gov.uk or call 01785 619401. 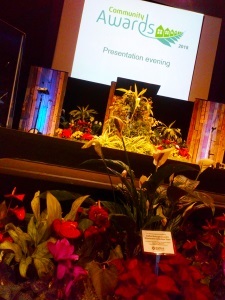 We have a wide range of plants suitable for formal events, exhibitions etc that can be hired at competitive rates. The plants are nurtured in the greenhouse at Victoria Park in Stafford and our team of experts will deliver and assemble to suit your needs. To enquire about formal displays please email streetscene@staffordbc.gov.uk or call 01785 619401.